The Fotodiox compact DY LED Fresnel is a versatile powerhouse of focusable and dimmable light for your next video or photo shoot. This versatile flicker-free light easily creates a wide variety of looks. On-board controls offer a full range of light levels, as well as control over the motorized focus to create looks from a wide floodlight to a powerful spot. You can adjust the light's intensity and focus in three ways. On-board controls with integrated LED display adjust all the functions of the light. You also have full control of the light using the included wireless remote, or by connecting it to any DMX compatible lighting control system (DMX cabling included).Separate ballast unit keeps the DY LED weight reduced for more mounting options. The adjustable yoke mounts equally well on a floor stand or hanging from a lighting grid (safety cable included). Included 4-leaf barn doors shape and control the light, and integrated gel clips make it easy to add your own gels and diffusion. The DY LED Fresnel gives off little heat, so the light housing and barn doors remain cool to the touch even after hours of operation. The high powered DY LED is available in either 5600 Daylight or 3200 Tungsten color temperatures, and has a remarkably low electrical draw for such a powerful light. Lower your energy bills, keep your studio or stage cool, and run these powerful lights on a regular domestic electrical circuit. The Fotodiox DY LED Fresnel light brings powerful, controllable light to your next video or photo shoot. Accurate flicker-free light, low power draw, simple cool-to-the-touch operation, remote controlled power and focus, solid construction, and mounting versatility all combine in this dynamic LED light. 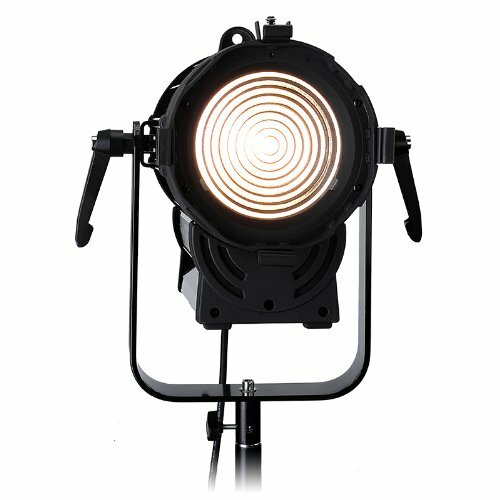 The DY LED Fresnel is a must-have for videographers, filmmakers, photographers, and theatrical venues everywhere!